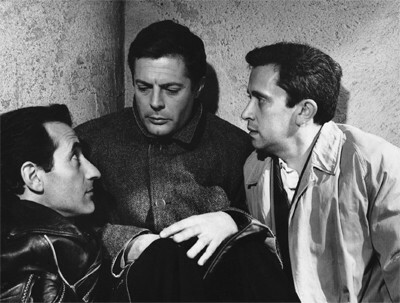 He might be best known for his collaborations with Federico Fellini in La Dolce Vita and 8 1/2, but Marcello Mastroianni, with his sleepy yet impassioned gazes and subdued yet effective charisma, left his mark in the early- and mid-‘60s by working with a broad network of renowned Italian directors.From Michelangelo Antonioni and Mario Monicelli to the beginning of a longstanding series of domestic dramas with Pietro Germi's Divorce Italian Style -- among others -- Mastroianni worked with many well-regarded filmmakers in a surprisingly short amount of time, and while he continued a very steady stream of output afterwards, this amounted to a half-decade span in which he collaborated with many of cinema's greatest artists. It's understandable, then, that any of the other, minor and perhaps lesser work Mastroianni starred it might become overlooked with time. Elio Petri's The Assassin, a leisurely-paced mystery hiding a moderately intriguing character study, is a prime example. Mastroianni plays Alfredo Martelli, an antiques dealer who shares an apartment with the cluster of assorted goods that he sells in his storefront. One day, Martelli is picked up by the police on suspicion of an undisclosed crime, interrupting his return trip to see his (soon-to-be) fiancé, Nicolette (Cristina Gaioni). 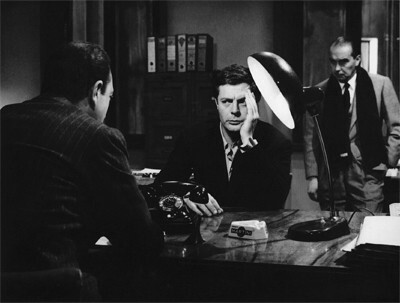 As he's being interrogated by Commissario Palumbo (Salvo Randone) and others, he slowly learns that the nature of his crime has to deal with the disappearance of his off-and-on lover, Adalgisa de Matteis (Micheline Presle), whose wealth and business dealings throw added suspicion at Martelli. In the confines of the police station, the interrogation probes at the many lifestyle choices made by Martelli, transforming into just as much of an examination of his character as it is an investigation of the facts themselves surrounding their interactions. Wrestling with the rigors of incarceration and keeping his story straight, Martelli slowly reveals the nature of his characters both to the police force and, behind closed doors and through flashbacks, to the audience, making one truly contemplate his innocence. A bold and suggestive title like The Assassin might make someone anticipate a degree of energetic thrills and plot twists, but that's not what Elio Petri's film is about, really. The mystery that unfolds is, frankly, not very engaging for being so cynical, hinged on revelations about the depths of the affair between Alfredo and Adalgisa and whether their bond -- alongside Martelli's questionably successful profession -- enabled a degree of cooperation that justifies labeling our protagonist as a suspect or not. This also becomes one of the primary downfalls of The Assassin: Elio Petri's fascination with the characters pulls his attention from deepening the evolving intrigues of the lovers' associations, wedging the film in the space between a procedural thriller and an intimate study of the complicated relationships in Alfredo's life. Petri and screenwriter Tonino Guerra never land on a way to properly blend these facets, while jazzy music and the close-quartered atmosphere of Carlo Di Palma's photography keeps things flowing at a very deliberate pace. The moving parts of the criminal case lack a hook, with the hopes that the peculiarities of Alfredo himself will hold onto the audience's interest. Fortunately, Marcello Mastroianni's character does exude more than a few compelling traits, naturally embellished by the actor's specific, idiosyncratic poise. Self-absorbed and uniquely emasculated, Alfredo juggles his displayed affections between two women in a way that only someone like Mastroianni's smarmy sort of charisma could really accomplish, exuding elements of both dishonesty and submissiveness that persistently leave one uncertain of what to make of his nature. In that regard, Elio Petri's script keeps the audience on their toes, planting seeds that could easily implicate the antiques dealer as a suspect while also countering those musings with displays of hesitancy and a lack of resolve on his part. Mastroianni's performance is unsurprisingly compelling, displaying deceitful craftiness during interrogation sequences -- at times, in the case of a torn-up business card, to the detriment of credibility -- as well as cool, motivated amorousness during flashbacks to his trysts with the women. Even with moments of dry humor and intimate flashbacks to Alfredo's past peppered throughout, The Assassin never rises above being a sluggish mystery with quasi-film noir sensibilities, one that assumes that the nuances of Alfredo's enigmatic and derisory personality are gripping enough for the audience to want to continue deducing whether he's capable of murder. Coupled with Mastroianni's performance, there are engaging layers to Alfredo's misunderstood romantic inclinations and his often-unlikable weakness while facing accusation and the turmoil of imprisonment, yet despite its modest timespan, the film reaches a point where the mood shifts, concealed details, and detective power-plays cease to translate into compelling invitations to scrutinize Alfredo's character. That leaves only the curiosity toward whether he's guilty or not to keep up its momentum, and the ways that The Assassin answers its questions exist in the same sort of middle-ground that it occupied from its jazz music-infused beginning, closing on an elusive and anticlimactic note that wouldn't be nearly as effective without Marcello Mastroianni's slyness staying on the line. There isn't a lot of complex imagery to be found in The Assassin, but the intimacy and consistency present in the cinematography has the distinct thumbprint of Carlo Di Palma, who also shot films for Michelangelo Antonioni, Woody Allen, and others. The nuance of his work shines through in the texture of the 1.85:1-framed photography, which this Blu-ray from Arrow Video once again masterfully draws out from the elements at their disposal, ranging from pristine negative to makeshift reels for a few stints. At its best, it's a stunning display of black-and-white cinematography, latching onto the weave of Mastroianni's jacket and the unmoving waves of his cared-for hair, while veering over into the coarseness of jailcell walls. As with their previous releases, contrast is of the utmost concern in Arrow's transfer, yielding rich black levels that accentuate the image's depth while preserving clear details in well-balanced shadows in the police station, the cell, and the shore. Some mild print issues and flat details here and there, even considering the source's issues at the beginning, are minor stumbles in what's otherwise a stunning digital transfer presented by Arrow. The 2.0 DTS-HD Master Audio for The Assassin isn't much to marvel at, but plenty of attention went into its restoration from a 35mm strip. Dialogue is, naturally, the crucial aspect to this stereo design, and it's oftentimes tough to work past the film's age in its resonance, yielding thin and somewhat muffled dialogue throughout that likely couldn't be improved due to its age and source. Clarity isn't an issue, though, with each moment delivered with strong enunciation against well-adjusted background noise, and the few moments of background noise -- the clack of typewriters, the splashing of water, the singing of soldiers marching -- hold onto a natural, albeit restricted presence . The other element involved with the track comes in the bursts of jazzy music played in the background here and there, which all points considering come through about as clear and strong as they can, despite the limitations of their age. Arrow's audio treatment gets the job done with reputability, but that's about it. The English subtitles are largely quite good, though a few grammatical errors show up at times. The extras for The Assassin are, unsurprisingly, a bit sparse when it comes to material dedicated to the film itself. Aside from a fairly objective Introduction by Pasquale Iannone (9:39, 16x9 HD), in which the resume of Marcello Mastroianni is revealed alongside a surprisingly lengthy clip from the film considering this functions as a "introduction" to The Assassin, Arrow Video have also included a btoad-scoped documentary focused on writer Tonino Guerra (51:15, 16x9 SD). Separated cleanly into chapters focused on specific directors, this pseudo-documentary relies heavily on Guerra to guide the discussion, which also veers into being something of an expose of his personal experience in the anecdotes he offers. Vintage production stills, shots of Guerra's artwork, and other unique tidbits fill out the 2008-sourced documentary, though it's probably best viewed in segments than watching the whole nearly hour-long stretch of chatter at once. Arrow Video have also included a Theatrical Trailer (3:45, 16x9 HD). The Assassin isn't a lively mystery or an entirely successful character study, but the substance of Elio Petri's intimate direction and the presence of Marcello Mastroianni still give this under-the-radar '60s dramatic mystery a distinctive attitude that's worth experiencing. Hinged on an antiques dealer embroiled in the disappearance and potential murder of his once-lover, the film subtle interweaves the forward movement of crime procedure with a magnified glimpse at the accused's temperament, perspective, and secrets, all of which are helped by the shifting attitude of Mastroianni as the peculiarly suspicious and charming Martelli. The pace is, indeed, slow and drowsy, and director Petri overestimates the staying power of the audience's interest in Martelli as either a unique personality or as a suspect, but Mastroianni's performance and the underlying mechanics of his character's duplicitous presence give this relic of the period in Italian cinema plenty of value. Very mildly Recommended for fans of the actor, the chance to see an underseen work from Elio Petri, and for Arrow Video's strong audiovisual presentation.